This rare archive footage shows the world’s first strategic bomber – the Airco DH9 (de Havilland). It’s hard to imagine the modern battlefield without precision strategic airstrikes but back in 1917 the technology was still in its infancy. Until the DH9 took to the air, pilots would drop their bombs over the side by hand. It was dangerous and inaccurate. The introduction of the DH9 to the Western Front in World War One meant larger bombs could be dropped more accurately far behind enemy lines. So the DH9 holds an important place in aviation history – it’s no wonder this example is being so lovingly restored at the Imperial War Museum Duxford. 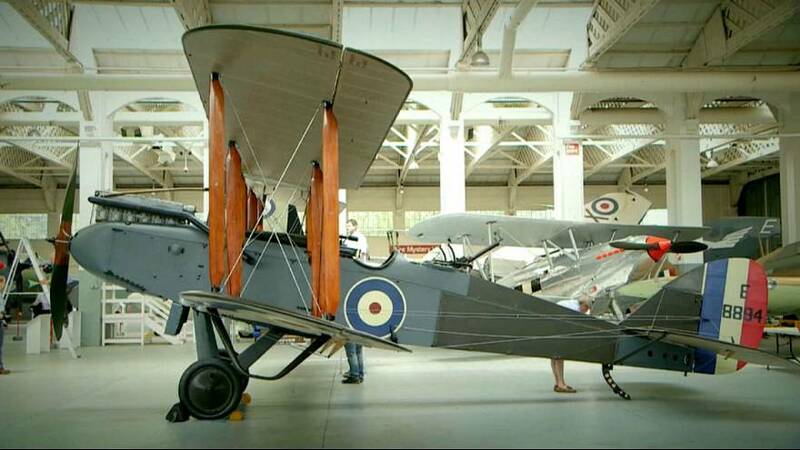 Getting the plane back to this condition has taken the team 60,000 hours of labour. As far as possible everything has been restored to its original condition – with the addition of a few modern safety features. Janice Black is the DH9’s owner and she is also a director of the Historic Aircraft Collection. She demonstrates the detonation mechanism for the bomb the DH9 once carried in battle… fortunately this one is inert. After service in World War One the British government gifted the aeroplanes to Commonwealth countries as a thank you for their participation in the war. The DH9 formed the first planes in India’s new air force. After its retirement it was taken to a maharajah’s summer palace and stored in an elephant’s stable. Janice Black explains the state of the plane when she first saw it in India. These photographs show the extent of the damage the plane had suffered from nearly a century of neglect. However, despite the poor condition of the DH9 Janice Black and her husband knew they had to own and restore this piece of aviation history. Historic aviation engineering is very much a male dominated world so Janice says she sometimes gets some surprised responses, but that her passion is just as strong. “Yes, particularly because I’m a woman. But it’s something you feel the passion in your heart for them, you can’t help it,” she says. After some careful work the two wings are finally attached and the DH9 is sitting smartly in the hangar. The mahogany wing struts look like examples of fine furniture and not the bracing joints of a military bomber. Carl Warner is a historian at the Imperial War Museum and he explains the significance of the DH9 in annals of aviation history. “Well 1917 marks a really important period for the Royal Flying Corps, the Royal Naval Air Service and aviation in general,” he said. :It’s a year where there’s still this incredible arms race between the development of German aircraft and British aircraft and it’s a year when the roles of aircraft are very much set. Unfortunately despite the foresight the DH9’s designers had shown, the plane was let down by an unreliable engine and many were lost over German lines as a result. An unreliable engine might be worrying news for a future test pilot of this DH9. The Historic Aircraft Collection team is hoping its DH9 will be restored to airworthiness and will take its first test flight later this year. Duxford will be a fitting launch site for the DH9, it was one of the first planes to fly from the airfield when it opened 100 years ago. Despite more than 4,000 DH9’s being produced now only a handful remain.